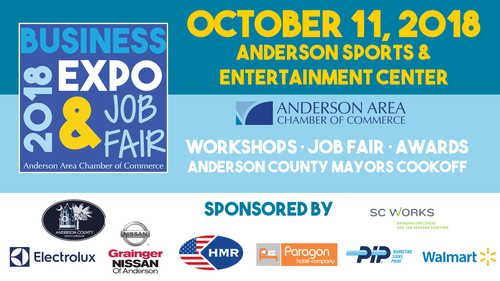 Join us on Thursday October 11th for our 2018 Business Expo and Job Fair! Exhibitor Package Includes: 8 ft. table, 2 chairs, and 3 ft. side rails. Electricity is available at a charge of $40, but exhibitor must make prior arrangements and bring their own long heavy duty extension cord. Exhibitor MUST provide their own table coverings and wastebaskets. The Exhibit Hall is NOT carpeted and the exhibitor will need to bring their own mat to stand on, or a carpet square. WiFi will be available the day of the Expo. Automobiles used in exhibits must disconnect their batteries, and cannot have more than ¼ of gas in their tanks. Guidelines: All Exhibitors must have two people manning exhibit at all times. Exhibitors must be in place by 2:00 PM on Thursday, October 11th. All exhibitors are responsible for shipment of exhibits to and from the Civic Center. Exhibitors can breakdown no earlier than 8:00 PM on Thursday October 11th. Want to market your business to the Anderson Community? Sponsor and support the Mayors in this new and fun exciting event! On Monday September 24th all exhibitors will meet and socialize from 12:30-2 PM. Your sponsorship will cover lunch! You will also be able to give a 10 minute presentation to your fellow exhibitors about your business! This sponsorship provides snacks, coffee and drinks for your fellow exhibitors along with displaying your company’s banner in the Business Suite. Display your company logo at the show and your company will be recognized by all attendees.